Our Wild Birds: More Morels!! So we kept looking for more of the Black Morels that we had found earlier... Well, this is what we found! LOTS (30+) of "Morchella Semilibra" or Half-Free Morels. Again the common names are kinda funny and I am not sure that they should be shared here... but... hmmmm.... MushroomExpert.com says that they are commonly called "peckerheads" and a couple other questionable names. Whatever you call them, they are DELISH! This evening half of the pound that I picked ended up in a wonderful Wild Mushroom Risotto -- wonderful! Yes, I know that this is not a food blog, but these guys were wildlife. :) Oh, and you may notice that I DID harvest one Black Morel - he's the guy with the bigger black cap in the upper right-hand side of the picture. 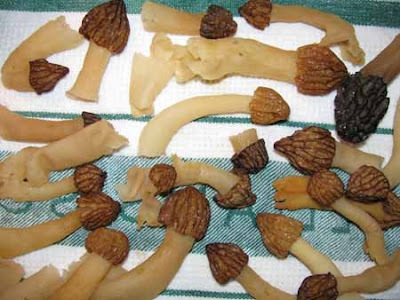 I LOVE morels! You have inspired me to find some woods and go hunting!